Duration: 75 minutes – 7:15-8:30p.m. 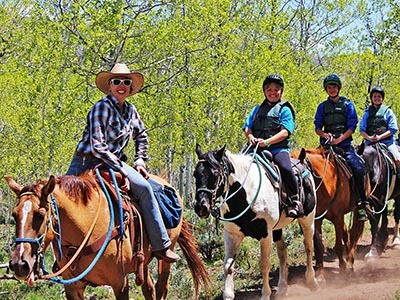 Meet your wranglers and travel through the scenic parts of Reid Ranch and other areas. Arrive at the Black-Shadow Corral for a 15 minute safety presentation and be introduced to your individual horse. You will be fitted with riding helmets and vests. You will then mount your horse and begin your trek. Ride for approximately 60 minutes. Look for wild flowers, ground squirrels, hawks or eagles, deer and other wildlife along the trail. Also, your guide can take pictures of you and your horse with the Ranch or scenic vista in the background. All participants must be at least 58" tall and weigh no more than 250 lbs. This tour is not recommended for expecting mothers. Guests should dress in layers for evening temperature. You should never feel that gratuities are expected, but it is customary to leave a tip in recognition of exceptional service for excursion guides. It is always up to you to determine the amount.